Le 15 Patisserie: Post Card from New York: Happy Thanksgiving! Post Card from New York: Happy Thanksgiving! This year I spent my favorite holiday, Thanksgiving, back in New York. Whats not to love about Thanksgiving--all you can eat delicious food surrounded with family and friends! Its been a while since my whole family was together to celebrate this delectable tradition and the night was truly a success. The process of Thanksgiving shopping usually starts 3 days before the big day. Thanksgiving always falls on the fourth Thursday of November, so that previous Monday off to the market we go. While Turkey is the main event of the night all the fix-ins and the starters are my favorite! Cut the stems of the artichokes off so that they will properly balance in a big pot. Grate 1 cup of Parmesan cheese. Put the artichokes in a pot filled with about 2 inches of water. Sprinkle 1 tablespoon of seasoned bread crumbs on top of each of the artichokes. Then sprinkle on 1/2 cup of Parmesan cheese evenly on top of each artichoke respectively. Place a cover on top of the pot and let the artichokes steam for about 40-45 minutes. You will know when they are ready when you can easily pull out one of the pieces. After the artichokes are ready remove the lid of the pot and sprinkle the rest of the Parmesan cheese on top of the artichoke. The petals of the artichoke should have opened up even more so the cheese will sink down into each piece. Then place the lid over the pot, but this time the fire of the stove should be off. Because of the resonating steam the cheese will melt down into each petal. After 2 minutes remove the artichokes from the pot. Be careful though they will be hot! For the artichoke dip: chop the garlic cloves very finely. Melt the butter and mix in the finely chopped garlic. Squeeze in lemon to taste and add salt the same. You are ready to serve! Preheat your oven to 350 F. Sift all dry ingredients (flour, baking soda, salt, cinnamon, nutmeg, pumpkin spice, sugar) together in a big mixing bowl. Spices should be measured in heaping spoons. Then add the four eggs, 2/3 cup of water, and 1 lb of canned pumpkin to the bowl. Mix all the ingredients with a wooden spoon until smooth. Pour the mixture into either a loaf pan or a bunt cake pan, whichever you prefer. Bake until spongy, which depending on the pan can take anywhere from 1 hour to 1 hour 15 minutes. I like to garnish with clementines or cranberries for color! Clean the Turkey, by rubbing it with rock salt and then showering it will cold water. You need to marinate the turkey the day before serving it to properly get the flavours of the fresh herbs. After the turkey is clean rub it with butter. I usually use about half a stick, but it depends on how much of a butter fan you are. Then rub the turkey with about 3 tablespoons of olive oil. Chop up your rosemary, sage and thyme into small pieces and rub the spices on the the turkey. I usually put extra rosemary because its my favorite herb, but the ratio is entirely up to your taste buds. Then pour about half a cup of red wine over the turkey and salt to taste. Sprinkle on the paprika at the end, cover the turkey with foil and shove it in the refrigerator over night. When its time to cook preheat your oven to 400, give yourself about 20 minutes-1/2 hour of cooking time for every pound of turkey you have. 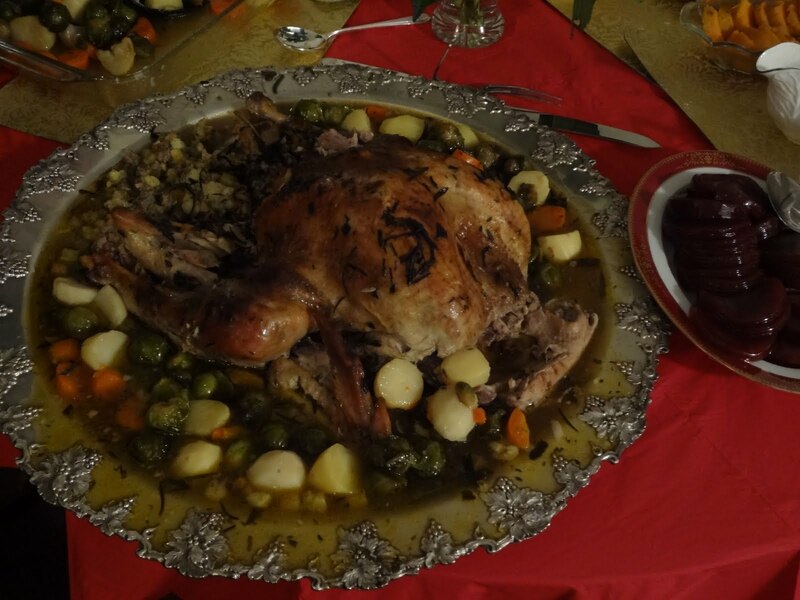 Baste your turkey with chicken stock every 45 minutes-1 hour to keep it moist. When your turkey is done change the oven from a bake to a broil. Broil until the top of the turkey is that perfect color brown, the paprika will give you the beautiful colour. Let it rest for 5 minutes before you carve. For veggies go simple and colourful: potatoes, carrots, brussels sprouts, corn and yams. 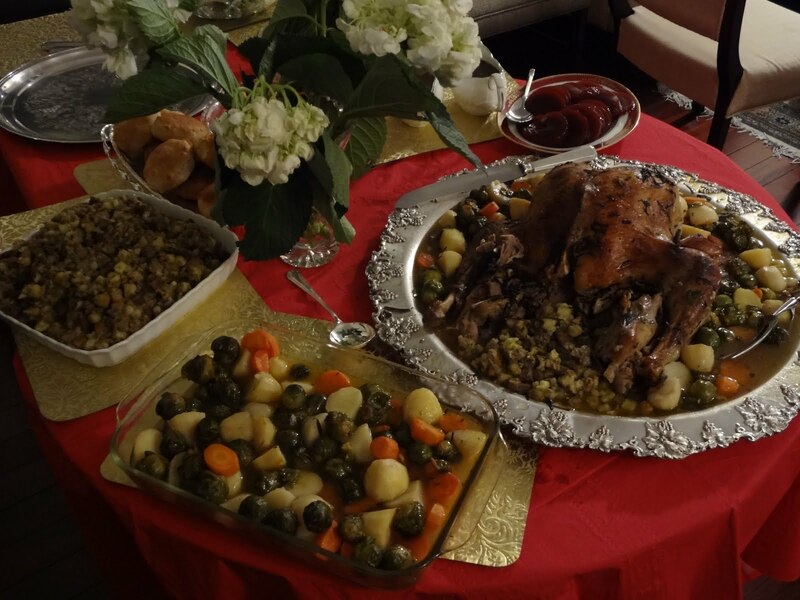 Since the turkey has a lot of flavour, don't overdo the veggies with spice. Instead chop them into small cubes and take out some of the turkey juice as a marinate. Roast the veggies alongside the turkey. Stuffing is essential, we usually throw in some sausages for that extra kick (For you veggies out there add in mushrooms). Cranberry sauce is a must to accompany the turkey. Plus it makes the table look even prettier :-)! No thanksgiving dinner is complete without apple pie and pecan pie a la mode. I'm sorry I don't have a recipe for you. Ours is usually store bought. Oops! 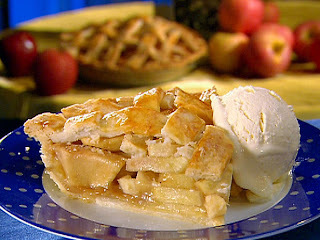 But a tip to serving apple pie, make sure you heat it up enough so that the inside is as warm as the outside. This usually takes at least 15 minutes in the oven, even when the pie is ready. Serve your pie with a heaping scoop of vanilla ice cream! And of course no Thanksgiving Dinner is complete without a game of Charades! Split your group up by boy v. girl or by age. The hardest movie this year in Charades was Limitless; the most fun to act out was Kung Fu Panda....just a suggestion :-). Enjoy! Lovely post. Reminded me of my first Thanksgiving - spent in Boston with a great turkey meal. Ended with apple and pumpkin pie shared between my hubby and me. Nice work may This so informative blog i ever seen thanks for this effort . Gaming world where everyone entertained with games like Friv 2 Online unblocked or Friv3 play unblocked or Yoob 100 unblocked games . The adventure racing game as Car Racing Games or game that a lot of people like the Super Mario Unblocked or Donkey Kong Unblocked is also very attractive. Have fun! nuova politica per i consumatori basata sul mercato Fofy Friv4school 2021 Fofy Per anni vi siete affidati ad Ethernet per la condivisione di informazioni Juegos Friv Juegos Twizl Fofy ous Grazie per condividere con noi Jogos De Twizl Juegos De Twizl Friv Di nuovo, ringrazio il Parlamento perché condivide la prospettiva di una Twizy Games Juegos De YooB i tuoi piani e mostrare paso dopo passo il progetto..
Herr Cashman, ich danke Ihnen für diese Information. Juegos Friv Kizi Juegos Friv Wir danken aber auch Ihnen Juegos De Friv Juegos Friv YooB liebe Leserinnen und Leser, fur Ihr Interesse und Ihre Mitwirkung Juegos Friv YooB Juegos Friv Juegos Friv die Informationsgesellschaft in der Schweiz voranzubringen. Danke, dafur dass Ihr jeden Tag mit uns die Hl. Messe gefeiert habt, fur all die Reparaturen im ganzen Haus Friv 10 Friv 2018 Friv 2019 fur Euere Bereitschaft YooB YooB Games YooB immer zur Verfugung zu stehen YooB Games Twizl Friv Games Jeux De YooB Danke, dass Sie Ihr Muhen um den Aufbau des Leibes Christi mit uns teilten. Play with millions of players around the world and try to become the longest of the day! Kizikizi | Shellshock Live is the best entertainment site with free games.